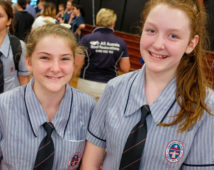 Students applying for entry at Emmaus are encouraged to attend the Welcome to Emmaus information session held in February. This event is a great opportunity to take a tour of our Yaamba Road Campus, experience all of our faculties, experience our co-curricular activities and enjoy a BBQ dinner with your family. A completed Application for enrolment form will need to be submitted to the College in order for an enrolment application to be processed. An Enrolment Levy of $50 (non-refundable) is payable upon application. certified copy of Birth Certificate or Extract, or original must be sighted by Emmaus College. PLEASE NOTE: To ensure your child’s enrolment can progress to the interview stage, please make sure you have completed all sections of the enrolment form and that all necessary documentation is included. If you are unsure about anything please do not hesitate to contact our Enrolment Officer at the College at enrolments@emmaus.qld.edu.au or on (07) 4923 5758. All students applying for enrolment will be required to attend an enrolment application interview. These will take place at the College and at least one parent/carer will be required to attend the interview with the student. 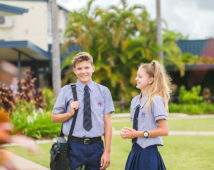 Interview times can be arranged by contacting the College on (07) 4923 5758.
Letters to parents/carers indicating the outcome of the enrolment application will be posted. Parents will need to confirm via return mail, acceptance or non-acceptance of the offer, along with the acceptance survey form. Acceptance Fee of $300 is required to secure a place at the College, this fee is non-refundable and non-transferable. Payment can also be made at either administration office at the College. 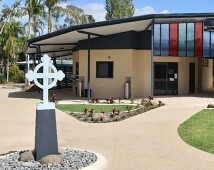 An Orientation Day will be conducted in November prior to the student commencing at Emmaus. A Parent Orientation Evening is also available in November, and is tailored to parents of commencing students. 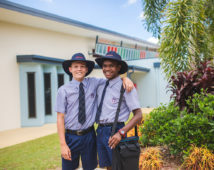 Please see the below links for further information about enrolling your child at Emmaus College.